Earlier this week I stopped by Nat Sherman on 42nd and 5th ave to pick out a new smoke. I was happy to find a new shipment of Plasencia Cosecha 146 cigars in stock. I’ve been a big fan of the Plasencia Alma Fuerte for a while now, so trying another new line was an exciting prospect. Plasencia Cosecha 146 is an exquisite combination of tobacco leaves from our 146th harvest (2011-2012). The leaves are grown in the best regions of Honduras and Nicaragua to produce a unique flavor profile, resulting from blending the crops of two great tobacco countries. 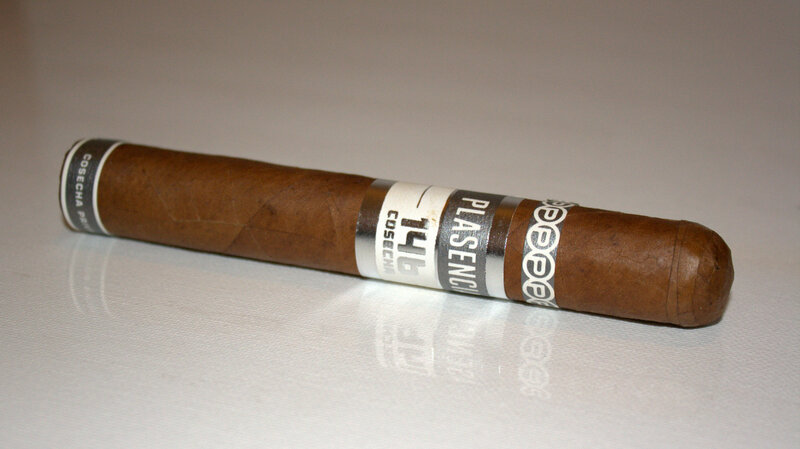 The Plasencia Cosecha 146 is a beautifully branded cigar, and right in line with the Alma Fuerte and Alma Del Campo. Like the Alma Fuerte, this cigar actually seems to weigh more than an average cigar of its size. It has a great weight in the hand, which really increases my anticipation to smoke this cigar. The Honduran wrapper is chocolate brown, smooth with a touch of oil, and completely flawless. The pre light draw is somewhat restrictive, with subtle notes of sweet tobacco and wood. Right out of the gate, the Plasencia Cosecha 146 opens up with notes of campfire logs, baking spices, and light cocoa. There is also a spiciness that tickles the top of my tongue and I can also sense on the back of my throat. The texture of the smoke, which is voluminous, is soft and fine, almost flour like. So far, a medium to full bodied smoke. Moving into the second third, the spice has picked up a bit. Construction up to this point has been good, but the burn has been consistently wavy. Notes are savory spiciness, wood, leather, all with some delicate floral notes in the background. Overall, very complex and well balanced. At halfway, the spice is joined by salt and black pepper, with a touch of sweetness, making for full bodied smoke. At this point, construction issues are starting to get a bit annoying, and seem to be the result of the Honduran wrapper having trouble staying lit. The final third is mostly the same, with the addition of a bit of heat to the smoke. The Plasencia Cosecha 146 is an enjoyable and unique offering from Plasencia. I really enjoyed the flavor profile that the cigar offered, as well as the changes in flavor throughout the smoke. Two factors that I didn’t enjoy: first, the flavors at time seemed to be out of balance and at war with each other for dominance. Second, the construction issues were a real inhibition toward free enjoyment of the product. Overall, this is a cigar I recommend you try at least once to make up your own mind. And, Halfwheel reports that Plasencia plans on more installments in the Cosecha line, so keep your eyes peeled for new releases.